Going out on tour for the first time can be fun and exciting, but there are some important things to keep in mind before piling into the van and hitting the open road. While we live in an age of modern conveniences, we often forget that technology isn’t perfect and can fail when you least expect it. Plus, not all parts of the country are as cell phone friendly or tech-savvy as the major metro hubs we might be used to. With that in mind, here are some analog relics (and a few digital toys) that will make life on the road easier in case you run into a few bumps along the way. Yep, the trusty AAA Membership – well worth the annual fee of about $50 in most areas. The card can not only help you get out of a jam if the tour van gets a flat tire, but it also covers the driver no matter what vehicle they are in. 100 miles of free towing is typically included in the membership price – enough to get to a service center if you break down in the middle of nowhere. Plus, the basic membership gets you discounts on hotels, motels, meals, shopping, and other items you might need on tour. Finally, many auto insurance policies offer discounts if you’re a member. You can plan your route down to the mile, but you can’t plan for traffic, accidents and other fun diversions that might take you off course. Staying properly hydrated is an important part of staying healthy on the road, especially you’re traveling in such tight quarters for weeks at a time. Always have a full case or two of bottled water in the back of the van for basic drinking purposes and emergencies. Stock up at local convenience stores along the way as your supply gets low. Remember cash? Yeah, we know, everyone has a debit and/or credit card these days. But guess what? That small-town diner near the club you’re playing (perhaps the only eatery in town) doesn’t take cards, and there’s no ATM in sight. A surprising amount of small businesses in Anytown, USA, are still cash-only, especially dining establishments and service-based industries. Have an inconspicuous stash of cash handy for the road, especially if you’re venturing into unfamiliar territories. It might be the difference between a hot meal and going hungry. No one thinks that anything bad will ever happen to them on the road. But the reality is, being prepared can make all the difference in the world. Each band member should prepare a folder of emergency information, in the unlikely case that authorities or medical professionals need to get in touch with your family or emergency contacts. Include a copy of your driver’s license, a list of emergency contacts, your home phone number and street address, and (most importantly) any relevant medical information that first responders would need in case you were incapacitated. Remember that AAA Card? Well, it can help you get a discount on a road atlas. “But my phone has GPS!” you say. Believe it or not, coverage can be spotty on long stretches of highway, and if your battery goes kaput, you’ll be SOL, my friend. A traditional road atlas will provide you with the routes and highway info you need in case technology fails you, and will also include helpful travel hints and emergency phone numbers. Just don’t let your drummer try to navigate. If you’re playing a hometown gig, you might be cool with letting another band on the bill share some gear and accessories – a mic stand, for example. On the road, playing with unfamiliar bands in unfamiliar settings, your stuff (no matter how hard you try, and how much you label it) will disappear. 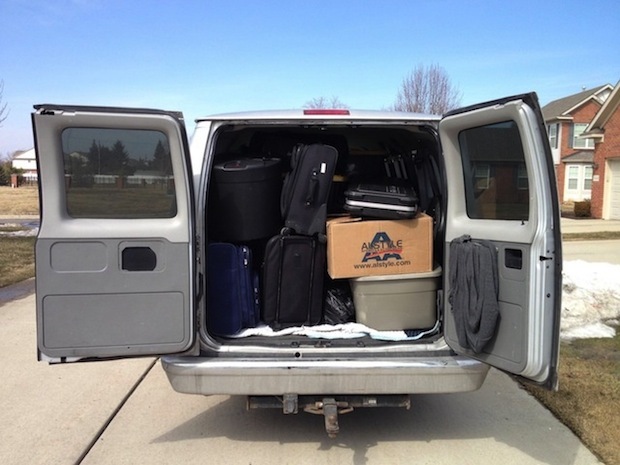 Keep the van stocked with extra mic stands, instrument stands, cables, tape, strings, picks, drum sticks, tuners, capos, and any other small accessories that are easily stolen. With limited van space, travel light. Pack enough clothes to get you through a few days max, but not enough for the whole trip. During stops en route to venues or while in town before a gig, hit up the local laundromat (and for the love of God, wash that damn Slayer shirt). Single-serve laundry detergent packs are cheap, and take up way less space than your entire wardrobe. Wash often, and you won’t have to lug space-hogging suitcases with you. Along with that stash of emergency cash, you should always have a roll or two of quarters packed away in the van. See the laundry situation above, and also remember the dead cell phone scenario. With a sleeping smart phone, you may need to revert to available pay phones in order to make emergency or business calls on the road. Believe it or not, many local bars, restaurants, and service centers still have functioning pay phone banks. If all else fails and you need to make an emergency call, local bus terminals or train stations are a safe bet when in search of pay phones. So far, we’ve focused on the things that can go wrong. Preparedness is great in case of emergencies, but you’re supposed to be having fun, too! And if inspiration strikes while you’re in the van, a USB microphone can be a great tool to have. You can document the tour’s progress for your blog/podcast, you can record song ideas to your laptop, and you can record shows along the way to preserve memories.